Arizona is a rockhounders paradise. There are wide expanses of public land open to collecting, and an amazing variety of different minerals to collect. Some are pretty specimens that are fun to add to your rock garden, while others can actually be quite valuable to collectors. 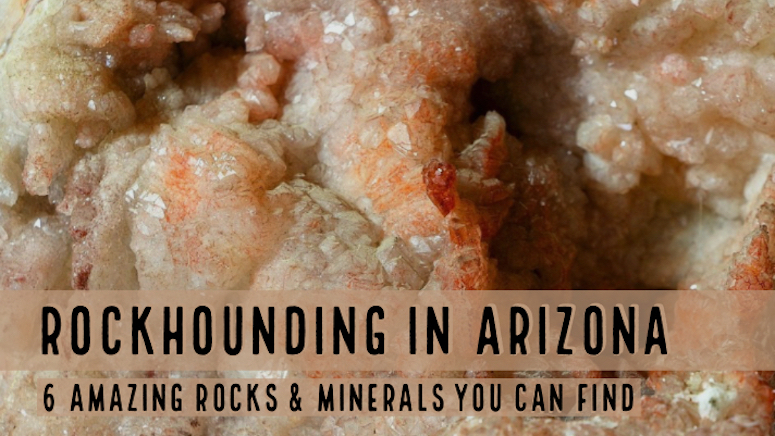 Let’s take a look at some of Arizona’s most interesting rocks and minerals. If you decide to venture out and try to find some of these yourself, just remember to be safe. Go prepared with food, water, and other necessities before you venture to far off the beaten path. Some exceptional fire agates can be found in Arizona. This beautiful mineral is very collectable and a prize for any serious hunter. They can be found in many places throughout the state. A few locations are worth noting. Perhaps the best known agate beds are between Kingman and Oatman along Highway 66, just west of Ed’s Camp. Another known area to find them is at a site now situated within the Kofa National Wildlife Refuge. The Saddle Mountain area southwest of Tonopah is yet another area known to produce nice samples from time to time. The washes east of Clifton have chalcedony that will occasionally have some “fire” in them, but they aren’t common. Be willing to hike a good distance and do some exploring. 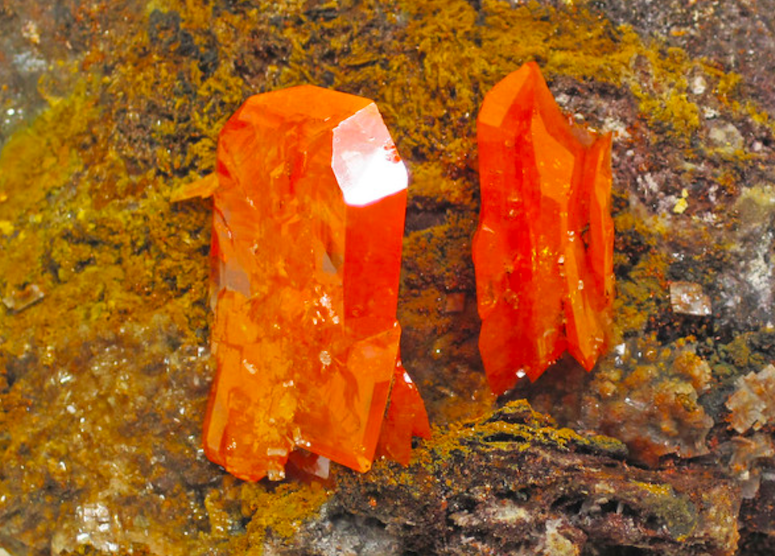 There are very limited occurrence of wulfenite in Arizona. Although it is not currently open to collecting, the Red Cloud Mine along the eastern side of the Colorado River near Martinez Lake has produced some dandy specimens. This mineral is noteworthy due to its high value to collectors. If you go to the Quartzsite Gem Show or Tucson Gem Show in the winter you will see small samples from the Red Cloud Mine. Even tiny thumbnail specimens bring a very high price. The Painted Rock Mountains have also produced some nice wulfenite samples, particularly at the Rowley Mine. When it comes to rockhounding, you truly never know until you get out and look. There is always a possibility of finding wulfenite specimens somewhere nearby that has not yet been discovered. The mountains are remote and there are lots of dry washes and abandoned mine dumps to explore in the surrounding area. These round nodules are a favorite for rockhounds, and if you find the right spot they can actually be quite abundant. When you find them intact, the real fun is when you get them home and cut them open to see the treasure that is hidden inside! The desert around Payson is one area with abundant agates. They range in size from tiny up to big ones the size of a grapefruit. Some have rather boring interiors but on occasion they will have nice crystallization inside. In southern Arizona, there are several good rockhounding sites near Gleeson in the Sugarloaf Mountains. There are lots of abandoned mines in this area and the dumps can have a variety of different minerals including nice agate and geodes. Of course, be extra careful anytime you are around old mining shafts! Perhaps the most abundant and widespread minerals all across the state of Arizona is jasper. It is a favorite with rockhounds because it is hard and can take a nice polish. You can put it in a rock tumbler or cut it into cabochons and use it for jewelry. Most jaspers are dark, solid colors. However, select pieces will exhibit nice banding and color variation. That is what you are looking for! The Bear Hills just east of Brenda contain some of these nice jaspers that can sometimes show nice orbicular patterns. Lots of color variations make this a great place to look for quality specimens. The Plomosa area and the hills southwest of Bouse have some nice collecting areas for jaspers and agates. There’s also some gold around here too. There are lots of good areas for jasper hunters around Quartzite and south toward Yuma. Honestly, you don’t need an “X marks to spot” location around here; the jasper is widespread and just about anywhere has potential. Put on your boots and explore! 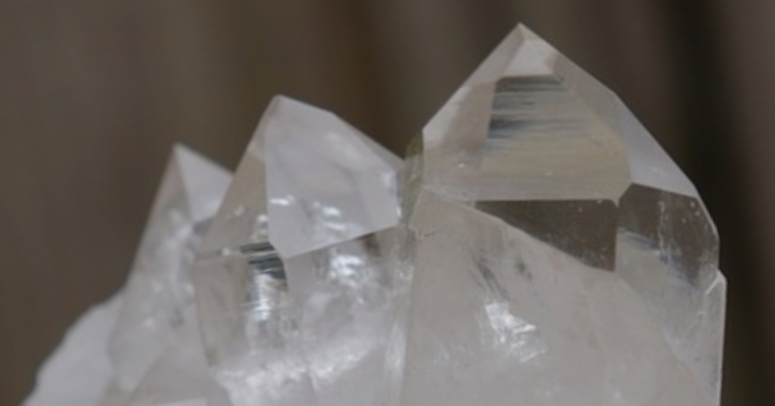 Quartz is one of the most abundant minerals on Earth, but finding it in nice crystalline form isn’t always easy. Fortunately there are lots of good places in Arizona that have really nice specimens to collect. The Date Creek Mountains area one of those places. This area has been hunted hard over the years but there are still nice pieces being found out here. You might get lucky and find a nice piece walking around, but the best specimens are found by people willing to do some digging. Look for old pits and get to work. Diamond Point northeast of Payson is another area with nice quartz crystals. This is a higher elevation site. Heavy rains can expose fresh crystals but you will definitely find the best stuff if you get dirty and do some digging. A popular collecting site is in the mountains north of Aguila. You can find some nice terminated quartz crystals in this area. One of the most popular crystal collecting sites in Arizona is at Crystal Hill, just southeast of Quartzsite. Due to its close proximity to Quartzsite and relatively easy access this area gets a lot of visitors. There is still good quartz here through because it takes work to find it. The best pieces are found by ambitions rockhounds who are willing to follow the seams and chip nice crystals out of the host rock. These simple little stones are a favorite with many Arizona rockhounds. These pretty little black stones can be kept as they are found, or you can tumble them for lapidary projects. Burro Creek intersects Highway 93 between Wickiup and Wickenburg. South of this intersection is a great area to find apache tears. You can find them along the creek and all up the hills in this area. The creek holds water and this is a lovely place to camp. There are several places around Aguila where apache tears can be found. Explore the desert flats south of town. Apache Tears Cave is located near Superior. There is a pay-to-dig site here that produces some very nice samples of apache tears. These area often very high quality and quite abundant. These are some of the states most popular rocks, but it really just scratches the surface. There are also many places that collectors can find petrified wood. Agates are abundant throughout the state. There are a variety of minerals associated with copper (azurite, malachite, chrysocolla) that you can find in many areas of Arizona. Just about every corner of the state has something for an ambitious rockhound. Always be safe when you venture out to explore Arizona. Avoid remote locations in the summer. Always carry adequate food and water. Let others know where you are going and when you will be back. You also need to check on the current land status before you start collecting. Some sites are private and require a small fee to collect. Others may be completely off-limits to collectors. Even on public lands, some areas can fall under mineral claim at any time and limit your access to certain areas. Do proper research before you leave home, and always respect signage when you are out in the field. Respect the beautiful Arizona desert and treat the land as if it were your own.